Sleep disorders are not just phantoms of the night. It’s not normal to feel sleepy during the daytime, to have problems falling asleep or staying asleep, or to wake up in the morning feeling unrefreshed. These are signs to talk about with your doctor. Some medical conditions can interrupt your normal sleeping patterns, without you even being aware of them. These medical conditions never let you reach a deep and restful state of sleep. As a result, you may never feel completely refreshed when you wake up in the morning. You may feel extremely sleepy during the day. Your energy and concentration levels may be affected. You may have trouble staying awake on the job, at home, or in the car. If you are having difficulty sleeping, if you snore, or if you are extremely tired during the day you should discuss your sleep patterns with your physician. The only way your physician can find out if you have a sleep disorder is to test your sleeping pattern, with a Polysomnograph (sleep study). Sleep tests are done here at Mason District Hospital, in one of two comfortable sleeping rooms. You sleep overnight and while you are sleeping, the staff uses various devices to measure your brain activity, breathing, and movements. For more information on the Mason District Sleep Clinic, call (309) 543-8160. Polysomnography, also called a sleep study, is a test used to diagnose sleep disorders. Polysomnography records your brain waves, the oxygen level in your blood, heart rate and breathing rate, as well as eye and leg movements during sleep. Polysomnography usually is done at a sleep disorders lab within a hospital or at a sleep center. You will be asked to come to the sleep center in the evening for the sleep study so that the test can record your normal nighttime sleep patterns. In addition to helping diagnose sleep disorders, polysomnography may also be used to help adjust your treatment plan if you’ve already been diagnosed with a sleep disorder, but your current treatment isn’t working well. Why have a polysomnography (sleep study)? The normal process of falling asleep begins with a sleep stage called non-rapid eye movement (NREM) sleep. During this stage, your brain waves, as recorded by an eletroencephalography (EEG), slow down considerably. Your eyes don’t move back and forth rapidly during NREM, in contrast to later stages of sleep. After an hour or two of NREM sleep your brain activity picks up again, and rapid eye movement (REM) begins. Most dreaming occurs during REM sleep. You normally go through four to six sleep cycles a night, cycling between NREM and REM sleep in about 90 minutes. Your REM stage usually lengthens with each cycle, from several seconds in the first cycle to up to an hour in the last. Sleep disorders can disturb this sleep process. Polysmnography monitors your sleep stages and cycles to identify if or when your sleep patterns are disrupted. When does a Doctor recommend you have a sleep study? 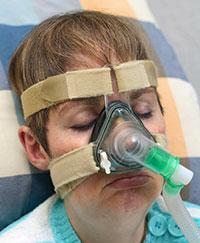 A sleep related breathing disorder, such as Sleep Apnea. Your breathing repeatedly starts and stops during sleep. You involuntary flex and extend your legs while sleeping. The sleep disorder is sometimes associated with Restless Leg Syndrome. You experience overwhelming daytime drowsiness and sudden attacks of sleep.
. You act out dreams while you’re asleep.
. You do unusual activities during sleep, such as walking, moving around a lot or rhythmic movements.
. You consistently have problems falling asleep or staying asleep. What should you expect when you have a sleep study? You will arrive at the sleep center in the evening for the sleep study and stay overnight. You may bring items you use for your bedtime routine, and you can sleep in your own nightclothes. The room where you participate in the sleep study is decorated similar to a hotel room and is dark and quiet during the test. You don’t share a room with anyone else. The room has an infrared camera, so the polysomnography technologist monitoring you can see what’s happening in the room when the lights are out and an audio system so they can talk to you and hear you from their monitoring area outside the room. After you get ready for bed, one of the sleep technologists places sensors on your scalp, temples, chest and legs using a mild adhesive, such as a glue or tape. The sensors are connected by wires to a computer, but the wires are long enough to let you move normally in bed. A small clip is placed on your finger to monitor the oxygen level in your body. All these measurements are recorded on a continuous graph. The polysomnography technologist monitors you throughout the night. If you need assistance, you can call them through the monitoring equipment. Although you probably won’t fall sleep as easily or sleep as well as you do at home, this usually does not affect the test results. A full night sleep isn’t required to obtain accurate sleep study results.